In recent times, the medium-term budget policy statement has taken on a larger-than-life role. In an atmosphere of an ailing economy combined with political instability, this event has been watched more rigorously over the years for signs of policy shifts– as well as the usual plethora of economic indicators, projections and revisions. So, the 2018 event was especially significant in that it combined all these elements as well as being presented by a new financial minister in his maiden speech (watched over by a new president) in an atmosphere of deep economic concern, governance uncertainty and a looming election. Importantly, as a ‘mini-budget’, this spectacle was never going to be an earth-shattering event in terms of policy shifts. That’s the domain largely of the main Budget, traditionally held in February. To expect real shifts in the new Ramaphosa-era was therefore unrealistic. However, that does not mean to say the event was dull – on the contrary, it provided a number of talking points that no doubt will not only occupy the minds of analysts and company directors, but also the internal discussion within the governing ANC itself. 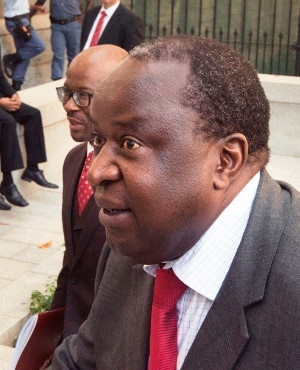 If we narrowly focus on the speech before Parliament itself, Finance Minister Tito Mboweni delivered a personal tour-de-force. Relaxed, professional, credible and informed, he managed to wrap a set of disastrous economic figures in a cloak of charm, humour and considerable gravitas. Although not a stranger to the Executive, Mboweni’s performance was impressive under the macro-circumstances already outlined. He combined a heavy dose of political spin with a wish-list for the future and enough of a ‘riot-act’ rhetoric to make some of his own colleagues squirm in their benches. Built into the speech was the bad news – the current state of the economy. A bigger-than-expected budget deficit, stubbornly high debt-to-GDP ratios, excessive public sector wage bills and an under-shooting of state revenue, if judged alone, reflects a failure of current economic policy and governance. For many governments around the world, such a set of results would place those in leadership positions in severe political peril and their political party in danger of losing the trust of the people. But Mboweni was able to package the bad news in an atmosphere of renewal. In line with his President, the sad statistics seemed less significant against the trend-line of Ramaphosa’s new generals sweeping clean and attempting to ‘drain the swamp’. The new finance minister was able to get away with a miserable report card on the basis that hope for the future is enough as a leap of faith. But there was another side to the day, which – perhaps – reflected the initial beginnings of a much more significant debate in our broader body politic and particularly within the ANC itself. In his morning pre-Budget media briefing, Mboweni introduced some concepts that might make the central planners within the ANC cringe. In the context of the failure of South African Airways and Eskom, Mboweni spoke about the possible ‘reconfiguration’ of the state-owned-enterprises and later suggested that there should be ‘no holy cows’ in shifting thinking (on the SOE’s and perhaps even broader economic policy). Although he didn’t quite utter the dreaded ‘p’ world (privatisation), there was more than just a hint that change could be in the air. Mboweni even suggested that it was not inconceivable that an entity like SAA might disappear to be replaced with a new public-private alternative. Furthermore, he also speculated about a non-Eskom national electricity grid comprised of independent power producers. Whilst these suggestions might just be Tito thinking aloud, they do represent a welcome shift from the moribund ideology of tight state control. It’s as if the window has been opened just a little and the issue will be whether it gains enough political traction and will to keep open and widen to real action in the years ahead. Trade Unionists wouldn’t have been too happy with Minister Mboweni’s critique of the expanding public sector wage bill. He repeatedly attacked this and could therefore set him up for a showdown with unions and party insiders who have long used the public sector as a repository for cadre deployment and patronage-based endeavour. Of course, Mboweni’s message was a reprioritisation from expenditure of public wages towards more growth-oriented capital development. Indeed, when governments stop playing expensive patronage politics, it may well find that is actually has some money in the bank to spend on the country rather than the party and its power aspirations. In addition, Mboweni also hinted at a dramatic reduction in the size of the Cabinet – another move that can upset those Ministers and their fiefdoms who have become accustomed to status and salaries. These nuances were the stand-out features in the mini-budget. Along with calls for greater efficiencies in governance, policy clarity and the prosecution of the VBS corrupt, the bad news had a glass-half-full feel to it. Still, whatever Mboweni, Gordhan and Ramaphosa might want for their wish-list, it’s their own party, the ANC, that will be their biggest obstacle. Only a complete defeat of those working against Ramaphosa will allow the necessary political will to prevail on some very sensitive issues for the governing party. Mboweni succeeded in putting down some markets, but there is a big unknown as whether he will be able to get his own party to sign on the dotted line.